Syngenta’s Proclaim is an active insecticide that can be used for the control of Heliothis, especially in vegetables. Proclaim’s high activity on many lepidoptera pests and relatively low ecological impact make it the ideal solution for growers who want to maximise the result and minimise any effect on beneficial species. Emamectin, the active constituent of Proclaim, comes from a novel type of chemistry naturally derived from soil bacteria. A Group 6A insecticide, Proclaim is a semi-synthetic second-generation avermectin. Its mode of action results in paralysis of the pest after intake of the product. When applied Proclaim is rapidly absorbed into foliage, building a reservoir of active ingredient within the plant for residual control that is protected from wash-off. Rapid photo degradation of remaining residues on the leaf surface limits the exposure to beneficial species. Once rainfast, Proclaim only affects the target pests that feed directly on treated plant tissue. Integrated Pest Management (IPM) seeks to incorporate the strategic and responsible use of selective insecticides to effectively control insect pests, while allowing the maintenance of beneficial species. Proclaim is ideal for use in IPM programmes, being extremely active against target species at low application rates, yet causing minimal disruption to populations of beneficial. Spray at first signs of insect infestation as indicated by local spray thresholds. Use the lower rate on low to moderate infestations. Add Citowett or Agral at the appropriate label rate. Spray at first signs of insect infestation as indicated by local spray thresholds. For good results apply soon after the Helicoverpa eggs have hatched. Do not apply more than 4 sprays of Proclaim per crop. Where more than 1 crop is grown per year do not apply more than 4 sprays per year. Ensure thorough spray coverage. Use the lower rate when targeting light infestations of small larvae. Use 250g/ha during periods of heavy insect pressure or under hot and sunny conditions. Proclaim should be used according to the AVCARE resistance strategies. Do not apply more than four sprays of Proclaim per crop. Where more than one crop is grown per year do not apply more than four sprays per year. Ensure thorough spray coverage. Use the lower rate when targeting light infestations of small larvae. Use 250g/ha during periods of heavy insect pressure or under hot and sunny conditions. Trellised Tomatoes: In the case of dilute spraying (g/100L) apply in the range of 400 to 500L/ha after transplanting and increase to 800 to 1000L/ha at full canopy. Proclaim should be used according to the CropLife resistance strategies. For good results apply just prior to or just after the Helicoverpa eggs have hatched, but before larvae enter the cob. Do not apply more than four sprays of Proclaim per crop. Where more than one crop is grown per year do not apply more than four sprays per year. Thorough spray coverage is critical. Larvae present within the cob at the time of spraying may not be controlled. Use the lower rate when targeting light infestations of small larvae. Proclaim should be used according to the CropLife resistance strategies. Proclaim has good environmental profile. Surface residues of Proclaim degrade within a few hours of application. Beneficial insects do not come into contact with the active ingredient once surface residues break down. With its proven performance and short withholding period, Proclaim insecticide from Syngenta has become a major defence against insect pests in the market gardening areas outside Melbourne. Werribee South supplies a large proportion of Melbourne’s fresh vegetables year-round. As such, having access to a reliable insecticide that effectively controls Diamondback moth grubs and Heliothis caterpillars in brassica crops and lettuce plays an important role in guaranteeing the city’s supply of fresh food. 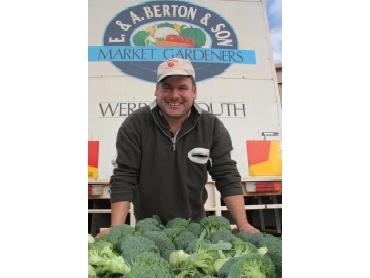 Michael Berton is one of the region’s 200 or so market gardeners, growing a range of irrigated lettuces, broccoli and cauliflowers. Three-quarters of his 26 hectare property is sown to a crop at any one time, with each paddock supporting three crops a year. Larvae hatching from migrating Diamondback moths and Heliothis threaten his crops every summer. Michael Berton said that the grubs burrow into the vegetables and make a real mess. Michael Berton also added that they are unsaleable in a market that wants pristine produce. The supermarkets have a zero tolerance policy. If they find one grub in a lettuce, the whole load gets knocked back. There’s no mercy. With the help of agronomists from E.E. Muir & Sons, Michael Berton monitors insect populations and sprays only when necessary. Depending on the time of year, a typical crop requires up to five applications of insecticide over its eight-to-16 week growing period. Michael Berton’s spray programme incorporates Proclaim. “It’s quite versatile, very effective in the paddock and easy to apply,” he said. To survive in a market renowned for its insistence on quality, south-east Queensland lettuce grower, Anthony Staatz, relies on fast-acting Proclaim insecticide to keep his crops free of destructive Heliothis caterpillars. Anthony Staatz grows 200 hectares of Iceberg lettuces on two farms at Gatton in the Lockyer Valley west of Brisbane and at Cambooya on the Darling Downs. He produces almost five million lettuces for the supermarket trade a year, half at Gatton during the mild winter months and half at Cambooya, with its higher altitude and cooler climate, over summer. Heliothis pose a big threat to his crops. The moths lay their eggs in the lettuce plants and newly hatched larvae chomp their way into the heads, leaving a trail of slimy waste. Given that single, grub-infested head can cause an entire pallet to be rejected, Anthony said it was vital to destroy hatching larvae as soon as possible. With Heliothis populations peaking in summer, lettuces at Cambooya typically receive up to eight applications during the six weeks it takes to grow each crop. Fewer sprays are needed in the slower growing winter-grown lettuces at Gatton, where the insect pressure is lower. Crops are checked two or three times a week, with the crop protection program adjusted according to insect pressure. Anthony Staatz rotates Proclaim with other insecticides to minimise the development of resistance in Heliothis populations.